If the winter months have taken their toll on your motivation and physique, fear not. Spring is here and we've got the perfect 6-week fat burning workout plan to bring you out of exercise hibernation. With most health and fitness goals, diet is so fundamentally important to results. In order to lose weight and sculpt a lean physique, you will need to make sure your diet is in check. Here are some helpful guidelines on how to eat over the course of the next 6-weeks for optimal results. This means burning more calories than you consume on a daily basis. Ladies, you will need to eat no more than 1500 calories per day. Gents, that figure is a little higher at 1900 calories. Protein helps to build and repair muscles. You should aim to consume between 1.5 - 2g of protein per kilo of body weight daily. Lean meat, poultry, dairy, nuts, seeds, eggs, and soy are all great sources of protein. A low to moderate intake of carbohydrates is required to shift the roly-poly. Aim for between 1 - 2g of carbohydrate per kilo of body weight daily. These carbohydrates should come from healthy sources in the form of fruit, vegetables, whole grains and legumes. Despite what you may have heard, fat does not directly lead to weight gain. By replacing some of your carbohydrate intake with healthy servings of protein and fat, you stand a far greater chance of achieving your ideal body composition (ratio: fat to muscle). Aim for 1.2 - 1.5g of fat per kilo of body weight daily. Coconut and extra virgin olive oil, oily fish (salmon, mackerel, sardines, skipjack tuna) avocados, nuts and seeds are all great sources of healthy fats. Try to avoid sugary snacks, highly processed food, alcohol, fried foods, refined bread, rice, and pasta and trans fats. If you still aren't sure of what to eat, try out the 30-30-40 weight loss diet. With a macronutrient split of 30% carbs, 30% protein and 40% fats, it's the perfect balance of macronutrients for sustainable weight loss. 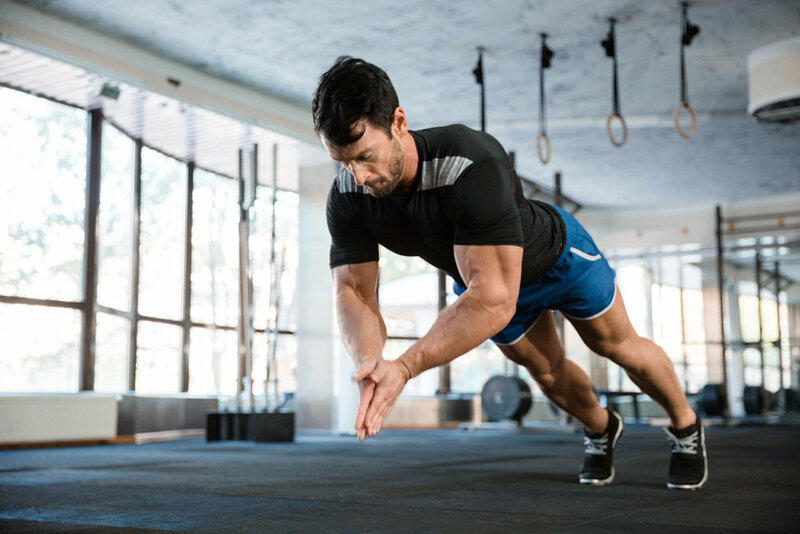 The 6-week workout plan is designed to help build lean muscle, improve your cardiovascular fitness and to kickstart your sluggish post winter metabolism into fat burning mode. The workout plan consists of 5 weekly workouts - two 50 minute full body circuit training workouts, two 30 minute HIIT (high-intensity interval training) workouts and one 60-minute moderate intensity cardio workout. Perform 10-12 repetitions of each exercise with no rest in-between. Perform as many rounds as possible within the 45-minute time limit. Notes: To feel the full benefits of all the exercises, you'll likely need a few different weighted Kettlebells. 8 rounds of 60-second high-intensity bursts with 60-90 seconds active rest/rest periods between rounds (Sprints, cycling, skipping, rowing etc). *Studies show that by working out on an empty stomach, you can burn 10-20% more fat during your workout. One of the reasons fasted cardio is so effective for fat loss is because, during periods of fasting (normally while you sleep), your body preserves its beloved carb stores and instead utilises fat for fuel during your workouts. If you can't handle working out first thing on an empty stomach, don't panic. HIIT workouts are extremely effective regardless of time of day or what you eat beforehand. Note: for the full fat-burning benefits of HIIT, It's important to push your anaerobic threshold. This means going all out during the 60-second bursts. If you are new to exercise and/or HIIT, start with 15-30 seconds bursts and gradually build up as your fitness level and confidence improves. A breezy 60 minutes of your choice of steady moderate intensity cardio (brisk walking, light jogging, cycling, rollerblading etc). Perform 10 repetitions of each exercise with no rest in-between. Notes: To feel the full benefits of all the exercises, you'll likely need a few different weighted dumbbells. Notes: If you are new to exercise or are returning from a period of inactivity, start slowly, gradually build up and always consult a doctor before beginning any exercise plan. Happy Spring and best of luck!! !